Every single person on this planet has a birthday and whether you celebrate it or not, it marks the date when you become that one year older. For those that are young, birthdays are happily celebrated as you become closer to the age of ultimate freedom (21) and for those that are older, well, birthdays tend to phase into any other normal day to try and ease the emotional pain of having responsibilities and wrinkles. Either way, I feel birthdays should be celebrated whatever age you are (or pretend you are) – be it big or small – as it’s the one day in a year that is all about you. I also love celebrating other people’s birthdays because, let’s face it, it’s a great excuse to have fun! Just my luck, BW decided to have his birthday dinner at a really high profile restaurant and you know me, if it’s paid for, I’m there for sure. 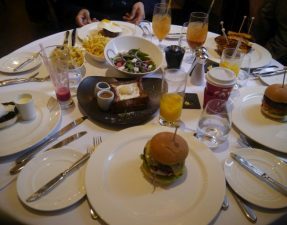 The restaurant that I visited was a high-class expensive restaurant, similar to Novikov, but instead of a dual cuisine, this restaurant specialised in something distinctive to all of us Halalarians. Steak. Glorious steak. 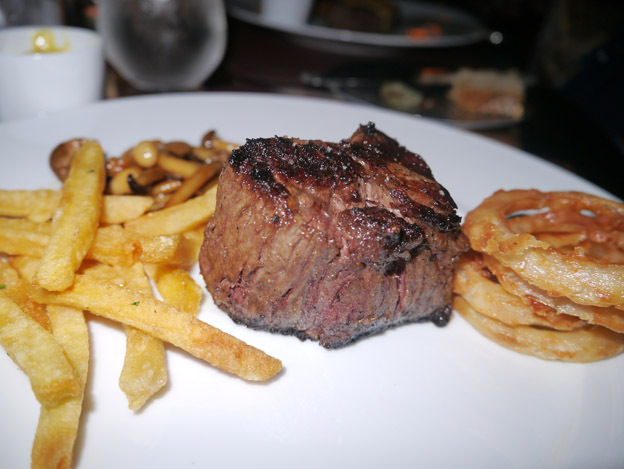 Despite its meat glorious menu, the restaurant CUT only offers three halal cuts of steak for one type of meat. The Rib-Eye, New York Sirloin, & Fillet Mignon all cut from the beautifully marbled Wagyu beef. These also happen to be the most expensive steaks on the menu and for those who are wondering what is so special about the Wagyu beef, the cattle are so well pampered that they are even given massages regularly! Enough cow talk for now, let’s get on with what you guys really came here for… the food! 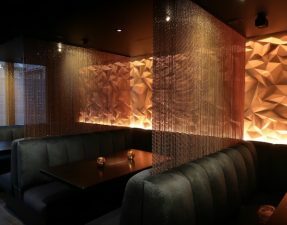 Once seated, we were shown the steaks that CUT offered and informed of the availability that night – it was a relief to know that the Wagyu was still on the menu! Soon after, the waitress approached our table with a selection of house breads that included focaccia, sour dough and maybe wholemeal, all of which were freshly baked that day to allow the bread to have the crispy yet soft exterior. 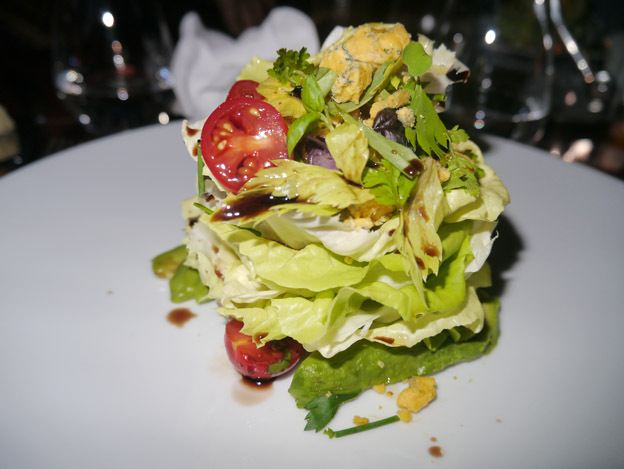 We opted for this salad, but without the champagne-vinaigrette, and to be honest, I was quite curious as to what butter lettuce actually tasted like. The lettuce came piled high topped with creamy yet strong chunks of blue cheese and slices of ripe avocado. We then topped the salad with generous amounts of olive oil and balsamic vinegar, and proceeded to try go about this tower in the most “proper” manner possible and instead ended up making a mess of the plate. It was a perfect and light starter to begin the night before the steaks came in and stole the limelight. Feeling my student loan quivering, I decided on choosing the cheapest steak, the “New Yorker,” out of the three and when I say cheapest I have to point out that my steak alone cost £84. 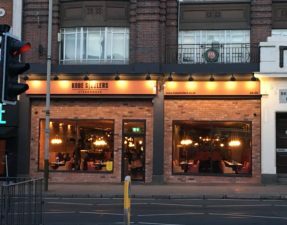 The birthday boy naturally chose the most expensive steak, the “Rib Eye,” which cost an eye-watering £92 and the other diners chose the “Fillet Mignon” priced at £86 each. 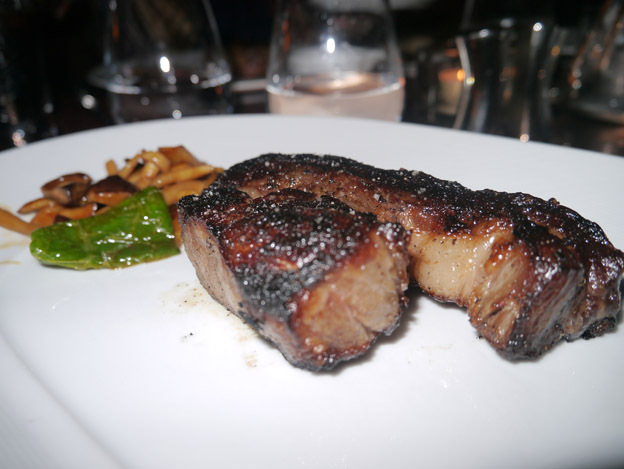 There is no better way to eat Wagyu other than cooked to a medium, medium-rare. This allows you to taste the tenderness and the juiciness of the actual beef itself, so I stuck with my usual order of medium cooked steak and sat quietly in hope to hide my eagerness and anticipation. Although not as tender as the other steaks, the “New Yorker” had a strong gamey aroma and showed a perfect crimson colour when cut. It was so soft and had so much extra flavour just from the melted fat itself; I didn’t really take much notice of anything else on my plate until after I had dreamily finished off my steak. Also, to be quite frank, I would rather finish my £84 steak than worry about any other trimmings. Despite the fact that we had to send the steaks back to have it cooked a little further, these little fellas came back piping hot. This meant the fat was able to melt into the meat letting the steak become tenderer and even juicier than any standard fillet mignon. And yes, I did refer to them as “fellas” because they are lean, meaty, and juicy to perfection. He doesn’t look like much, but he was one of the best steaks I have had in my 21 years of existence and now that I’ve set the threshold so high, I don’t think any other steak will compare to this handsome fella. I may have been saying that because I was chewing on a £92 piece of beef, but regardless of the price, this was beautiful. 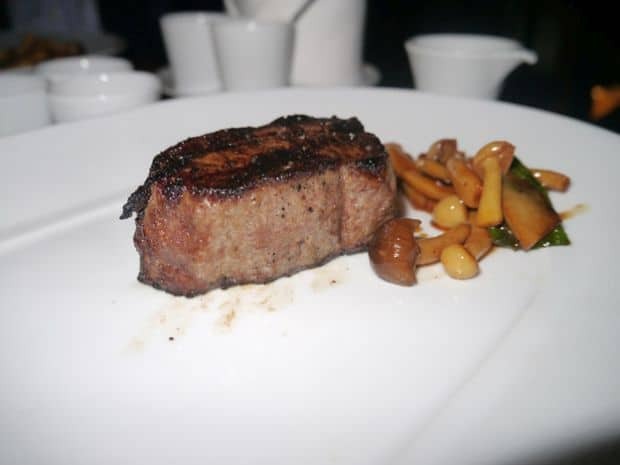 Unlike most steaks with fat, the rim surrounding the meat did not have a chewy texture and due to the immense marbling of the fat within the meat, every bite you take literally melts in your mouth. Unfortunately, this steak did not belong to me, it belonged to BW, so I sufficed with the one bite that I was given, but this would be the steak to order. The four sauces – Béarnaise, steak sauce, Argentinian chimichurri , and wasabi-yuzu kosho butter – albeit being so complementing to the steaks, were barely touched as the meat itself did not need any extra flavouring. The tempura onion ring tower was slightly greasy yet crispy and well worth the order, and the herb infused fries were thin, crunchy and a great addition to the meal. The wild field mushrooms, I found, was the only side dish that did not live up to the expectations of the meal as I had found it slightly too salty, but despite this, they were still finished off very quickly. 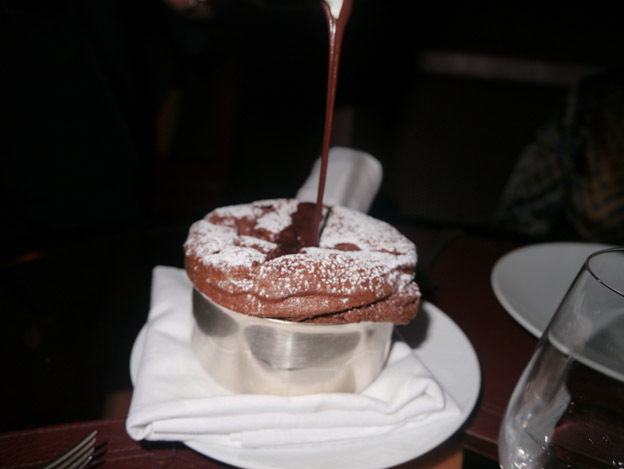 And how could I forget the dessert; this was a gigantic soufflé that came piping hot to the table, which was then topped with chocolate sauce, fresh crème fraîche, creamy hazelnut ice cream and then further topped with even more chocolate sauce. 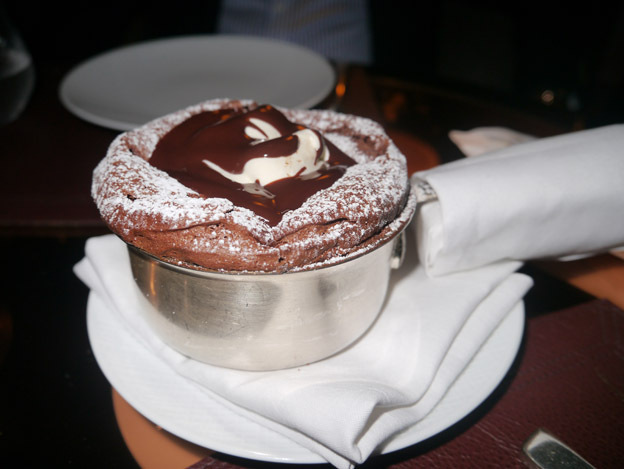 The chocolate soufflé tasted delicious on its own and when topped with all the extras, became super sweet hitting a tasty sugar wall quite quickly. The bill amounted to £460, so £115 per person. Was £80+ worth it per steak? Definitely not for a casual Saturday night outing, but for a very special occasion, it’s well worth the damage. This is the real deal; good quality steak cooked to perfection with tenderness and flavour and no need for any other trimmings. CUT offers you the best steak experience and despite its shaky service, such as some of the steaks not being cooked as much as we would have liked or the waiter forgetting our dessert order, I would gladly keep on returning to this place just to get my steak fix (well if it was a little more affordable for a now-and-then casual affair). P.s. I’ve heard the burger is to die for and is available when pre ordered! FYI you can pretty much order anything from the menu halal if you give at least 48 hours notice 🙂 – try the burger!! Oh really, I didn’t know that, I will have to re-review this – can’t wait! Thanks for the heads up!